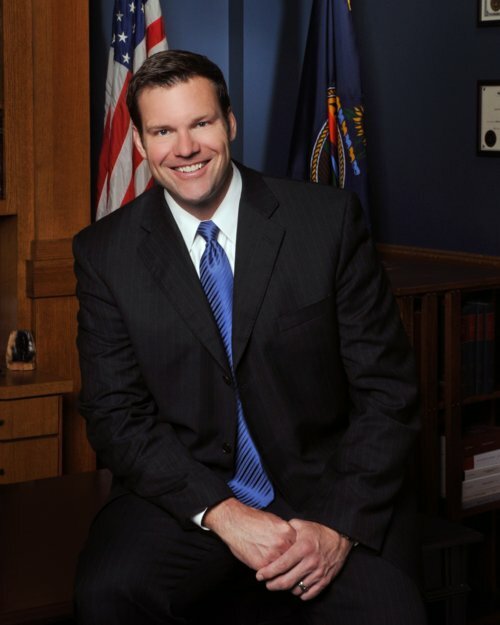 Two photographs of Kris Kobach, Kansas Secretary of State. Kobach graduated from Washburn Rural High School in Topeka, Kansas in 1984. Four years later, he earned an A.B. in Government from Harvard University. After graduation he was awarded a Marshall Scholarship which allowed him to earn M.A. and D.Phil. degrees in Politics from Oxford University. He then returned to the United States and attended Yale Law School where he earned his J.D. in 1995. He is a former chairman of the Kansas Republican Party and city councilman in Overland Park, Kansas. In May 2009, he announced his candidacy for the Republican nomination for Secretary of State. In November 2010, he won the election for Kansas Secretary of State.